Readers who are looking for a story about the history of the Third Reich's secret weapons should look elsewhere. For those of us who are enthralled by statistics and diagrams, this book is for us. The book does not only dwell on one weapon system, but shows all of the different types manufactured or on the drawing board. The author also starts out by going backwards in history, and shows us a little about the large caliber guns that were German secret weapons in World War I. The book takes us through the tanks, jets, and rockets, along with much more, that were used or dreamed up by the German engineers in the Second World War. There are tidbits of information on every page. Did you know that a Panzerkampfwagen IV, and Panther cost about the same to make as a Sherman tank? The same chart shows that a Tiger I or II cost roughly three times more than the aforementioned tanks. There are also charts that show the monthly production rates for the Tiger I and II tanks. Charts and diagrams that show the different speeds, armor thickness, and gun calibers of some Allied and German tanks are shown. According to the book, an IS2 tank was slower than a Tiger I, and a Churchill VII crawled along at only 15.5 MPH. The Maus is here along with the unbelievably huge land battleships of the 'P Series Land Cruisers'. These had 11" guns the same that were in the Scharnhorst battleship/battle cruiser. 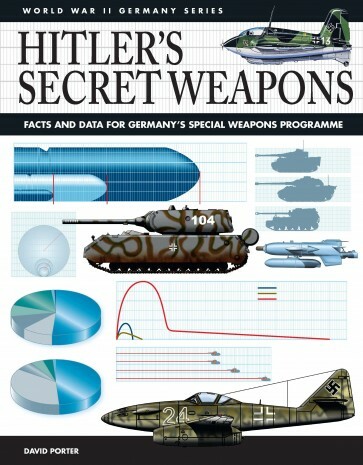 The book also shows the different railroad guns Germany made, and a chart compares their various muzzle calibers.So the largest gun ever built, the railroad gun Gustav, is here. Its smaller brothers of 'Anzio Annie' fame are shown here also. The author also shows us the state of the art infantry anti-tank and anti-aircraft weapons. Each weapon has a small write up about it. The main focus of the book is the charts and diagrams that are liberally shown throughout the volume. Land, Air, and Sea weapons are shown, from the largest battleships ever dreamed of to miniature submarines. From 'Mistel' bombs (a fighter with a bomber attached to the bottom of it filled with explosives) to jets that actually made it off the drawing board and were produced by other countries after the war, this book has them all. So if anyone needs a reference book that has the dimensions of a E100 tank or a H-45 battleship, this is your book.